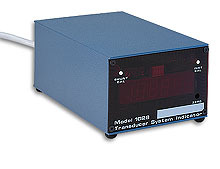 The Model DP1028 Transducer Indicator System is a heavy duty 4 1 /2 digit indicator with excitation for up to ten 350 ohm bridges. Standard features include a dead zero and front panel instrument calibration and transducer shunt calibration pushbuttons. With its rugged metal case and heavy duty power supply, the DP1028 has proven to be a highly reliable monitor in industrial applications. 참고: 1) Power cord supplied. 115 Vac models have standard plug, 220 Vac models have stripped ends. 2) For panel mount units add suffix "-PM" to part number and add $25 to price.